The market for kiosk in North America has been expanding at a robust rate in recent times, majorly due to the need for kiosks across several industries. The market players in the North American kiosk market have become accustomed to the fluctuations of the market and have been working in accordance with the varying needs of the consumers. The market for kiosk in North America displays a scenario of intense competition due to the homogenous goal of expansion held by all the market players. It is anticipated that the market vendors would elevate their quality standards and increase the utility served by the kiosks in order to attain supremacy in the market. Furthermore, the leading market players are projected to invest huge sums of money towards marketing the kiosks sold by them. This would give an upper hand to these market players because the customers are easily swayed by efficient promotion and marketing. Furthermore, the smaller market players are foreseen to form unions amongst themselves to challenge the strongholds of the larger players. 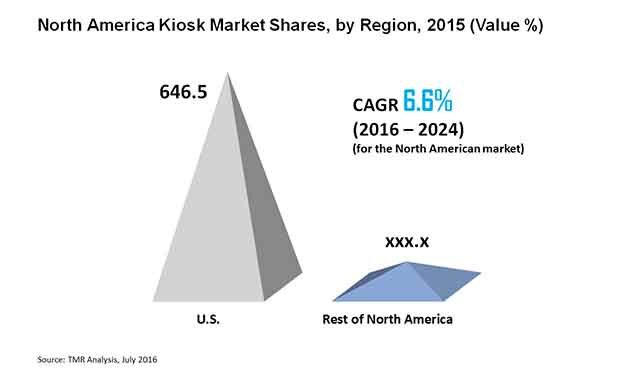 Some of the key players in the North America kiosk market are Meridian Kiosks, Optical Phusion, Inc. (OPI), NCR Corporation, ZIVELO, Diebold, Inc.,Phoenix Kiosk, Olea Kiosk Inc., Kontron AG, Kiosk Information Systems, Fujitsu Ltd., Wincor Nixdorf AG, Slabb Kiosk, and RedyRef. It is projected by Transparency Market Research (TMR) that the market for kiosk in Nortj America would reach a value of US$4.4 bn in 2024, elevating up from a value of US$2.5 bn in 2015. Furthermore, the CAGR of the North America kiosk market is expected to be 6.60% over the period between 2016 and 2024. The demand for kiosks across the retail industry has been abundant because of the tremendous utility served by kiosk to the retail sector. Extension of inventory is an important function within the retail industry, and kiosks help in accomplishing this with palpable ease. Furthermore, bill payments and remittance of gifts can also be done through kiosks installed at the entry and exit points of retail shops. Automated retail vending machines are also a part of kiosks, which further established the relevance of kiosks in the retial sector. Besides this, the healthcare sector has also been an ardent consumer of kiosks for a range of functions. The registration of patient details in the records of hospitals is done through kiosks while the sale of medications is also carried out the same channel. Hence, the demand for kiosks in North America has been touching new heights in recent times, and is expected to keep tracing an escalating trajectory. Despite the ascending demand graph of the market for kiosks in North America, the high costs associated with the installation and maintenance of kiosks is expected to hinder the smooth flow of the market. However, the benefits served by kiosks are tremendous, and this is expected to make up for the limitations of kiosks. The market for kiosks has done especially well in the US, majorly due to the economic stability and wellness of the healthcare sector in the country. The review is based on TMR’S report titled “Kiosk Market (Application - Retail (Inventory Extension Kiosk, Gift Registry Kiosk, Bill Payment Kiosk, Loyalty Kiosk, Automated Retail Vending Kiosk), Healthcare (Wayfinding/Directory Kiosks, Patient Check-in/Check-out Kiosk, Hospital Information Kiosk, Human Resource Kiosk, Virtual Receptionist Kiosk, Patient/Physician Communication Portal) - North America Industry Analysis, Size, Share, Growth, Trends and Forecast 2016 – 2024”.